Note: This quote by Louis Jordan, is more accurate a description about Web 2.0 that we realise. Huge quantities of data files are being uploaded to the internet every day. Latest statistics from YouTube say 60 hours of video are uploaded every minute. With cloud storage being offered for low prices, we are gathering digital data at an incredible rate, which not only questions, do we need to store all this data, but, how are we going to find anything ever again? Do a search on Google theses day, you rarely get what you are looking for. Unless you know how to search. I’ve become an expert at searching, I though it was because, I was just becoming more saavy, until I realised, I was, unknowingly becoming more metadata aware. I have been trying to get round to learning more about metadata, and how it can be used for my research, but then I realised it should not be just for research. Metadata is for Life! My Aha, Eureka moment came, when my back door wouldn’t open. Naturally I turned to Google. Instead of typing in, how to fix a back door, and getting a gazillion useless results, I searched for types of doors (mine’s a uPVC), what type of hinge (I found out it was a flat hinge), then I put the following in the search engine, ‘uPVC door, flat hinge, won’t open’. I got a few forums, and video tutorials on what to do when the lock in your uPVC door isn’t unlocking correctly. Result. At Digitalis 2.0 a Conference organised by the students of Digital Humanities at University College Cork, in 2016, one of the keynote speakers was Deirdre Ní Luasaigh, co-founder of Culture Ark. Culture Ark is a Digital Archiving and Preservation company, based in Ireland. Ní Luasaigh spoke about the importance of metadata, for accessing and future proofing data, in particular to important archival material. With new technologies coming to the fore every day, the current formats, media, software and even the hardware we use, could face obsolescence in around in ten years. Since, most of our data, in particular with cultural and personal heritage, is now saved in digital format, losing this information would be a great loss to future society. She also mentioned emerging standards for metadata such as Dublin Core. Her talk was very interesting, because, although I was aware of metadata, it was not a strategy I had thought of integrating into my research. Metadata is data that provides information about other data 2. It provides information about an item, or its content, for example, common metadata properties for an image could include: creator, description, title, headline, keywords, location, licence, size, and resolution. A text document’s metadata may contain information about information such as how long the document is, author, date written, summary and date published. “data” with “meta-,” which means “transcending” and is often used to describe a new but related discipline designed to deal critically with the original one. “Metadata” takes the “transcending” aspect a step further, applying it to the concept of pure information instead of a discipline. “Metadata” is a fairly new word (it first appeared in print in 1983), whereas “data” can be traced back to the middle of the 17th century)3. A few reasons to use metadata are mentioned above, such as future proofing your archives or data. However, there are other reasons, why a metadata strategy should be implemented, in any kind of digital data you create. If there was a standard metadata description across document types, created by different organisations, there would be much easier access, improved retrieval of information and better interoperability across systems, from governments to non-profits, business to museums. All organisations need to be compliment already with certain standards, of say record keeping and revenue. A standard of compliance with management of digital data is just as important. Many of us use metadata without even realising it. Search for music on Spotify, and you have a choice to search by artist, album, song title, because they have metadata embedded in the audio files. Search for a book on Amazon, and you have a range of criteria you can select from. These are not just tags, added on top of the image associated with the file. The information can be embedded within the file itself. This is called Embedded Metadata. We use metadata everyday without realising. Photographs we take with our camera phones has embedded metadata: the date we took the photo, the size of the file. Knowledge about metadata is not just the reserve of archivists and researchers. Anyone who uses the internet, who uploads any kind of content, from photographs to videos, blogs to websites, should know about metadata. Photographers posting their photos, artists posting images of their art work, writers their work in online journals or magazines, should all have a basic grounding of metadata creation. These digital forms can have a metadata file attached or embedded with the information you choose to add. It will only take a small step of awareness to step from unconscious metadata to consciously recording metadata. Understanding what metadata is, and creating simpler tutorials and tools is the key. It should be taught not just at a university level, but at a school level, as it affects everything we do, as we become a more digitized world. While data curators, and increasingly researchers, know that good metadata is fundamental, the challenge to create a metadata strategy, that meets with personal and future users needs feels like a complex task to the majority. Facilitating the development of community or discipline-specific metadata sets that work within the frameworks of cross-domain discovery and metadata interoperability [Weibel & Koch 2000]. As a visual learner, I am always searching for visualizations of what I am researching. 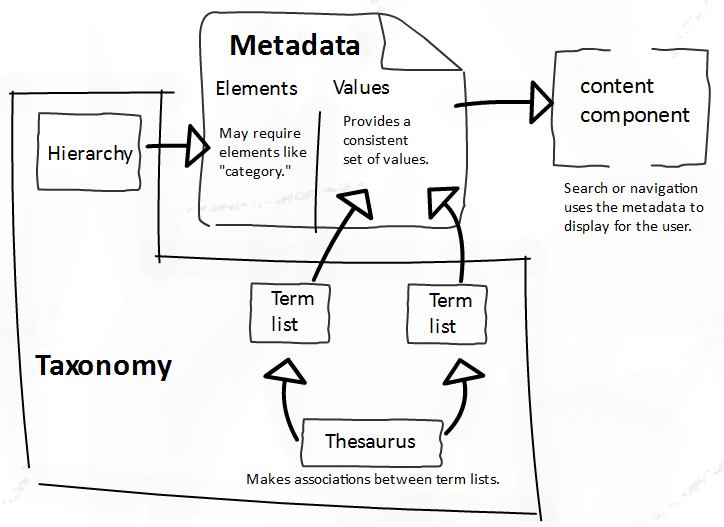 Among the thousands of boring charts and graphs, I came across these diagrams of Metadata in an article on BrainTraffic.com, An Intro to Metadata and Taxonomies, written by Christine Benson. Finally, a diagram that makes sense! (They don’t hold all the relevant information however, if I get the time, I will draw up my own diagrams and revise this article). Synthax: encoding standards; a container for the structure, semantics and a set of rules by which the contents should be interpreted: eg RDF, EML, XHTML, DHML. It gives the computer system the instructions on how to interpret the record as a whole. Structure: fits inside the syntax and is composed of a metadata scheme. Examples of structure include Dublin Core, Encoded Archieva Description (EAD), Visual Resources Association (VRA) Core 4.0. This gives humans instructions on how to interpret the information within individual tags (eg creator, title, subject). The Wendler taxonomy with metadata divided into three functional categories: Descriptive, Administrative and Structural. 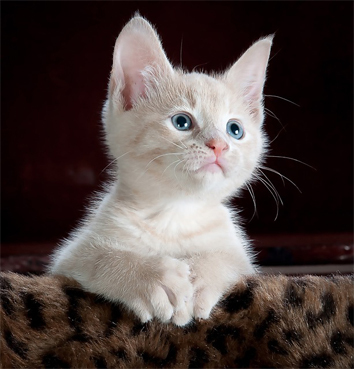 To observe better how this categorisation works, and to relieve the eyes from text for just one moment, I will introduce a picture of a cute kitten. Above is a breakdown of some possible elements of the metadata I could write about the image. Structural: In the first column, Structural, the red type describes the internal structure of documents: The headings or elements of the photo eg Title, Tags, Descriptions, Created by, Date, Source, Usage Rights. Administrative. In the second column, in blue, we add the technical information about the digital images creation: copyright and licensing informations, the source, the date it was created, and who created it. Descriptive: In the third column, used to identify and recover digital objects; we added the name of the image, the description of the image content, and tags about the content. To explain about taxonomy, I must return to the article by Christine Benson, and replicate another of her diagrams. Taxonomy is the process or system of describing the way in which different living things are related by putting them in groups 5. Good metadata can make up for mistakes we can make. With our computers becoming more and more filled with digital data, a good filing process is essential. In today’s economy, with temporary or zero hours contract, or even voluntary organisations, the digital footfall of people through data has never been greater. By implementing a metadata strategy, workflow, ease of and access to information will be more successful. or the new phenomenon of social tagging, which we are all familiar with. Free-form tags, not edited by professionals. They tend to be descriptive, collection of keywords, or tags, used for navigation, filtering and searching. Site such as Flickr, or YouTube allow for social tagging; the users create the metacontent, by attaching tags to their uploaded digital web content, it tends to be more user-friendly but perhaps not as uniform. I will be discussing in further articles about metadata including tutorials on how to create metadata for various program, links to online guides and also its relevance as a digital tool for community participation. By demystifying digital language, and its potential uses; we can create conversation about digital systems, that are user friendly. A ‘bottoms-up’, grassroots approach to the evolution of digital technologies, rather than a ‘top-down’, academic approach. An example of this is the term, Folksonomy, coined by Thomas Vander Wal in 2004. Constantly, the words of Heidigger keep coming back to haunt me. It is essential, through the development of the web, the information, the digital world we live in, that at all times, we keep the human element in the back of our minds. Technology should be used to free us from the toils of this world, not make it harder, make us work harder, and make us feel we don’t or wont understand. That is what religion is for, the mysteries. We need to put more folk back in, but without the long hair and flared trousers. The essence of technology is nothing technological, that is to say technology cannot be understood through its functionality, but only through our specifically technological engagement in the world [Heidegger 1977].